NEW online career and education planning system that will help you make informed decisions about your future. Create an account and LOGIN to FOCUS 2. First time user? 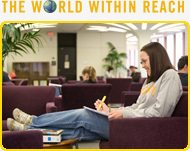 Create an account with your albany.edu email address and be sure to use the access code Damien. How will FOCUS 2 help me make decisions? CAREER READINESS: Answer questions to get started thinking about your career. SELF ASSESSMENT: Take assessments that match your answers to UAlbany majors and careers. Gain the most out of the system by taking all five self-assessments. CREATE AN ACTION PLAN: Focus ideas and decide on steps to achieve your goals. How long does FOCUS 2 take? During first use, students typically spend between 45 minutes to 1 hour. Log in any time afterward to research over 1200 careers that FOCUS 2 profiles. It will always save your work. Okay, I took FOCUS 2. Now what? Once you have completed FOCUS 2, make an appointment with a career counselor to review your results, answer any questions you may have, and discuss your career plan.